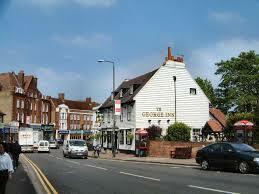 Beckenham is a suburban town, famous for its Chinese Garage and the historic St George’s Church. Beckenham is accessible by car via the A234, A222, and A2015. Beckenham has good public transport links and has three main railway stations: Beckenham Junction station, New Beckenham station and Ravensbourne station. Established in 1914, Lanes School of Driving, has been providing driving lessons for over a hundred years. Over this time, Lanes has flourished to become one of the largest independent driving schools in the UK. Lanes is renowned in the local community for its commitment to quality instruction, honed through years of experience. Lanes offers individually structured driving courses to suit each unique student. Lanes have been providing driving lessons in Beckenham, Kent for many years. Please call us today on 020 8166 5678 or click here to send us an email via the contact page. Lanes have a team of driving instructors in Beckenham, Kent. Please call us today on 020 8166 5678 or click here to send us an email via the contact page. Lanes have a selection of female driving instructors in Beckenham, Kent. Please call us today on 020 8166 5678 or click here to send us an email via the contact page. It is common for students to have a preference for automatic cars over manual. Some say manual cars provide more control. Despite this, automatic cars can be easier to handle, and can be a lot less stressful. Beginners often find it hard not to stall their car. The wonderful thing with automatic cars is that they are designed not to stall. Additionally, the learning curve on automatic cars is more gentle and students can learn a lot faster. Lanes have a selection of automatic driving instructors in Beckenham, Kent. Please call us today on 020 8166 5678 or click here to send us an email via the contact page.